We will begin by learning how to open a Recordset with an SQL statement. You will learn how to load a list of customers into a Listbox using your Recordset. 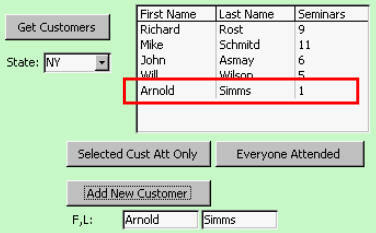 You'll learn how to generate a list of active states based on which states appear in your customer table. This way you don't have to see a list of all 50 states if you have no customers from most of them. You'll learn how to modify the records in your Recordset. In this case, we'll make a button that you can click once and it will increment the number of seminars that each customer has attended. You will learn how to work with Multi-Select List Boxes so you can pick one or more specific records in a listbox to work with. You'll learn how to add new records to your table and listbox using the recordset. You'll learn how to delete the selected records. Finally, you'll learn how to use db.Execute to run an SQL statement.